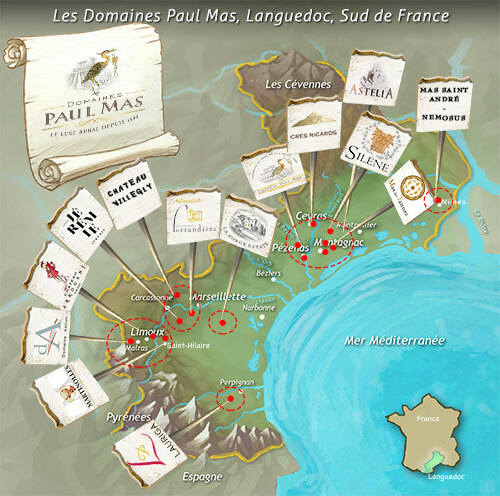 Domaines Paul Mas currently cover around 750 hectares of wine country in the heart of the Languedoc. Considered a flagship of the Sud de France brand, our wines express all the richness and diversity of the region. Domaines Paul Mas has over 800 hectares of vines on its own estates, 20% are organic. Add to that 1,500 hectares at contracted partner vineyards. We can therefore blend with some 45 different grape varieties, native and noble, from a fantastic range of diverse Languedoc terroirs. This diversity is all down to the unique situation of the region, bound by the Mediterranean Sea to the south and the mountains of the north, and by its geological formation. “Luxe Rural” (Everyday Luxury) sums up our culture and philosophy. With the greatest respect for our rural roots, we aim for perfection. Our wines are the result of our mission to inspire real emotions.